Visitors to the Wizarding World of Harry Potter at Universal Studios are able to cast “spells” by waving special interactive wands in the air. Hackers like us understand that there must be some unknown machinations happening behind the scenes to detect how the wands are moving, but for the kids wielding them, it might as well be real magic. So when his son asked to have a Harry Potter themed birthday party, [Adam Thole] decided to try recreating the system used at Universal Studios in his own home. The basic idea is that each wand has a reflector in the tip, which coupled with strong IR illumination makes them glow on camera. This allows for easy gesture recognition using computer vision techniques, all without any active components in the wand itself. [Adam] notes that you can actually buy the official interactive wands from the Universal Studios online store, and they’d even work with his system, but at $50 USD each they were too expensive to distribute to the guests at the birthday party. His solution was to simply 3D print the wands and put a bit of white prismatic reflective tape on the ends. With the wands out of the way, he turned his attention to the IR imaging side of the system. His final design is a very impressive 3D printed unit which includes four IR illuminators, a Raspberry Pi Zero with the NoIR camera module. [Adam] notes that his software setup specifically locks the camera at 41 FPS, as that triggers it to use a reduced field of view by essentially “zooming in” on the image. If you don’t request a FPS higher than 40, the camera will deliver a wider image which didn’t have any advantage in this particular project. 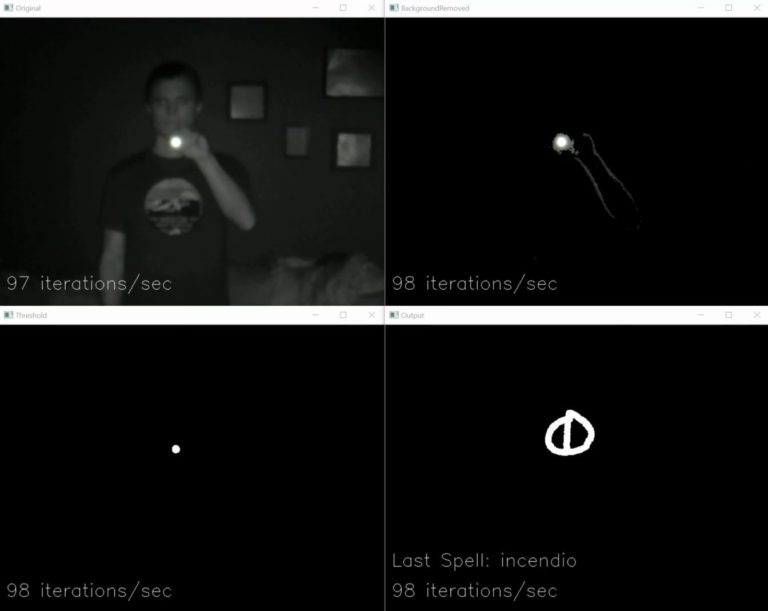 The last part of the project was taking the video stream from his IR camera and processing it to detect the bright glow of a wand’s tip. For each frame of the video the background is first removed and then any remaining pixel that doesn’t exceed a set brightness level if ignored. The end result is an isolated point of light representing the tip of the wand, which can be fed into Open CV’s optical flow function to show [Adam] what shape the user was trying to make. From there, his software just needs to match the shape with one of the stock “spells”, and execute the appropriate function (such as changing the color of the lights in the room) with Home Assistant. Overall, it’s an exceptionally well designed system considering the goal was simply to entertain a group of children for a few hours. We almost feel bad for the other parents in the neighborhood; it’s going to take more than a piñata to impress these kids after [Adam] had them conjuring the Dark Arts at his son’s party. It turns out there’s considerable overlap between hacker types and those who would like to have magic powers (go figure). [Jennifer Wang] presented her IMU-based magic wand research at the 2018 Hackaday Superconference, and in the past we’ve even seen other wand controlled light systems. If you go all the way back to 2009, we even saw some Disney-funded research into interactive wand attractions for their parks, which seems particularly prescient today. Over the years, Nintendo has had little trouble printing money with their various gaming systems. While they’ve had the odd misstep here and there since the original Nintendo Entertainment System was released in 1983, overall business has been good. But even for the company that essentially brought home video games to the mainstream, this last year has been pretty huge. The release of the Nintendo Switch has rocketed the Japanese gaming giant back into the limelight in a way they haven’t enjoyed in a number of years, and now they’re looking to keep that momentum going into 2018 with a killer new gaming accessory: a cardboard box. Some of the contraptions feature surprisingly complex internal mechanisms. Well, it doesn’t have to be a box, necessarily. But no matter which way you fold it, it’s definitely a piece of cardboard. Maybe a few bits of string here and there. This is the world of “Nintendo Labo”, a recently announced program which promises to let Switch owners create physical objects which they can interact with via specially designed software for the console. 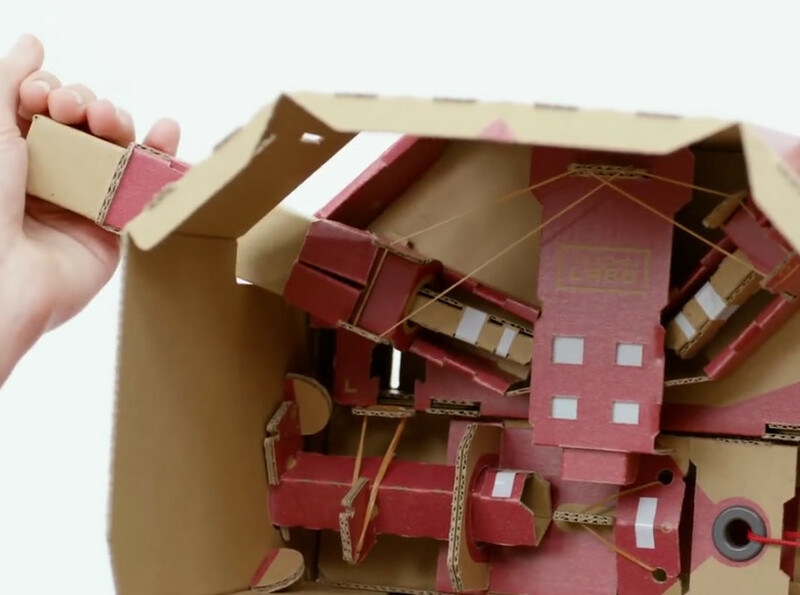 The Labo creations demonstrated in the bombastic announcement video make clever use of the very unique Switch hardware. The removable Joy-Con controllers are generally still used as input devices, albeit in less traditional ways. Twisting and tilting the cardboard creations, which take varied forms such as a fishing rod or motorcycle handlebars, relays input to the appropriate game thanks to the accelerometers and gyroscopes they contain. Many of the more complex contraptions rely on a less-known feature of the controller: the IR depth camera. By pointing the controller’s camera inside of the devices, the motion of internal components, likely helped along by IR-reflective tape, can be tracked in three dimensions. 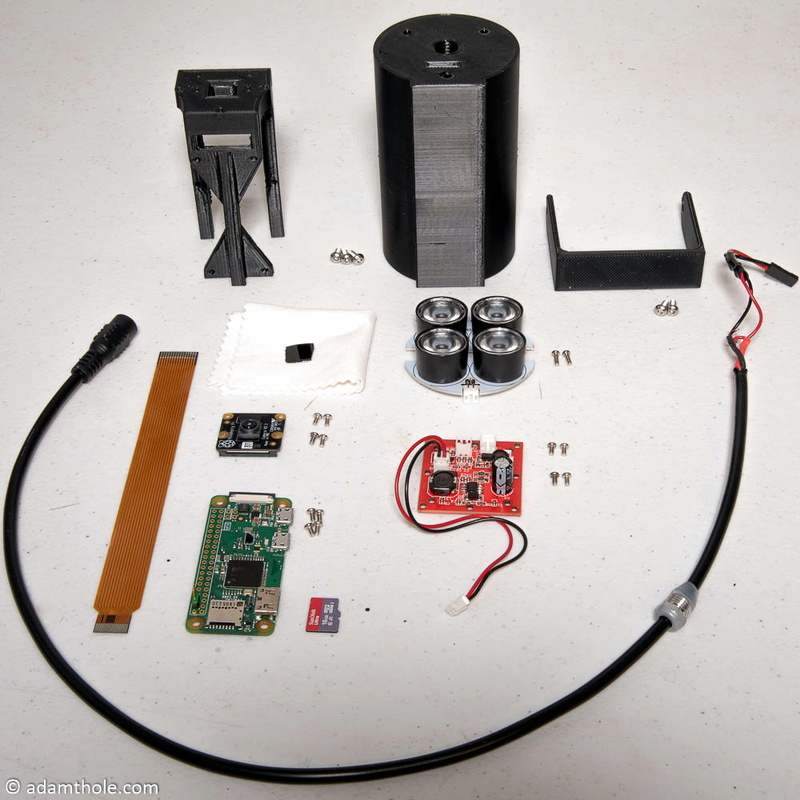 In the video, the internal construction of some of the devices looks downright intimidating. Clearly some of the gadgets, not to mention the folded cardboard construction, are aimed at children, an age group Nintendo has never been ashamed to appeal to. But some of the more advanced devices and overall concept seems like it would play better with creative teens and adults looking to push the Switch in new directions. Will users be empowered to create their own hardware, and by extension, associated software? Will hackers and makers be able to 3D print new input devices for the Switch using this platform? This is definitely something we’ll be keeping a close eye on as it gets closer to release in April. The popularity of the Switch has already given rise to a surprising amount of hacking given how new the console is. It will be interesting to see if the introduction of Labo has any effect on the impressive work already being done to bend the console to the owner’s will. Tindie is a great place to find uncommon electronic components or weird/interesting boards. [Xose Pérez] periodically “stroll the isles” of Tindie to keep up on cool new components, and when he saw Panasonic’s Grid_EYE AMG88 infrared sensor, [Xose] knew that he had to build something with it. The awesome find is an 8×8 IR array sensor on a breakout board… the hack is all in what you do with it. Already taken by “LED fever,” [Xose’s] mind immediately fixated on an 8×8 IR array with an 8×8 LED matrix display. With a vision, [Xose] threw together an IR sensor matrix, a LED matrix, a small microcontroller, a Li-Ion battery, a charger, and a step-up to power the LEDs. What did he end up with? A bulky but nice camera that looks fantastic. While commercially available IR Cameras have thousands of pixels and can overlay a normal image over an IR image among other fancy stuff, they are sometimes prohibitively expensive and, to quote [Xose], “waaaaaay less fun to build”. Like any engineer, [Xose] still has ideas for how to improve his open source camera. From more color patterns to real time recording, [Xose] is only limited by the memory of his microcontroller. Moreover, [Xose’s] camera is inspired by the Pibow cases made by Pimoroni and this is only one project in a series that uses a stack of laser cut pieces of MDF and acrylic for the project enclosure. What’s not to love: short fabrication times and a stunning result. Want more project enclosures? We’ve got plenty. After [Casey Connor] captured and relocated a number of unwanted rodents in his home using commercially available live traps, he was presented with a problem: a rat had learned to avoid them. In an epic, and adorable, conflict caught on video (and embedded below), he documents the designs used and how the rat escaped them by either recognizing the trap, or sheer agility. We can only tip our hat to the determination of both parties. 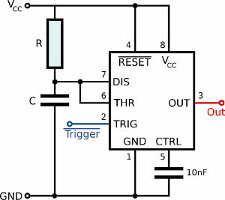 All the trap mechanisms are based on a 555 monostable solenoid triggering circuit that ensures that a pulse of sufficient duration is sent to the solenoid to trigger the trap correctly. This way even intermittent contacts will trigger the trap rather than just causing the solenoid to twitch without fully actuating. This is the same technique used to debounce a switch using a 555 timer. A Raspberry Pi Zero detects motion using an IR camera to film the interesting parts. This is also a good indicator for when you’ve trapped your quarry – if you’re trying be humane then leaving it in a trap for days is counterproductive. With the time and effort we spend building better and more complex rodent traps, we sometimes wonder who has cleverly trapped whom. Some people really put a lot of effort into rigging the system. Why spend years practicing a skill and honing your technique to hit a perfect bullseye in darts when you can spend the time building an incredibly complicated auto-bullseye dartboard that’ll do it for you? In fairness, what [Mark Rober] started three years ago seemed like a pretty simple task. He wanted to build a rig to move the dartboard’s bullseye to meet the predicted impact of any throw. Seems simple, but it turns out to be rather difficult, especially when you choose to roll your own motion capture system. That system, built around the Nvidia Jetson TX1, never quite gelled, a fact which unfortunately burned through the first two years of the project. [Mark] eventually turned to the not inexpensive Vicon Vantage motion capture system with six IR cameras. A retroreflector on the non-regulation dart is tracked by the system and the resulting XY data is fed into MATLAB to calculate the parabolic path of the dart. An XY-gantry using six steppers quickly shifts the board so the bullseye is in the right place to catch the incoming dart. It’s a huge amount of work and a lot of money to spend, but the group down at the local bar seemed to enjoy it. We wonder if it can be simplified, though. Perhaps tracking just the thrower’s motions with an IMU-based motion capture system and extrapolating the impact point would work. [Oitzu] in Germany wrote in to let us know about a series of short but very informative blog posts in which he describes building a series of solar-powered, networked birdhouses with the purpose of spying on the life that goes on within them. He made just one at first, then expanded to a small network of them. They work wonderfully, and [Oitzu]’s documentation will be a big help to anyone looking to implement any of the same elements – which include a Raspberry Pi in one unit as a main gateway, multiple remote units in other birdhouses taking pictures and sending those to the Pi over an nRF24L01+ based radio network, and having the Pi manage uploading those images using access to the mobile network. All with solar power. Build a better mousetrap, and the world will beat a path to your door, but what about a smarter mousetrap? [Alain] decided to find out by making a Raspberry Pi-powered, Internet-connected smart trap. The brains of the operation is a Pi running Arch Linux. Connected to that is a IR trigger, a servo to unlatch the sliding door, and a camera to see your new friend. The housing of the trap is CNC cut foam PVC board, which is both easy to cut and to clean. Once the IR beam is broken the Pi turns the servo, which pulls a pin on the front door. Once your new friend is settled in a LED light turns on to illuminate the subject, a picture is taken and sent via email. With automated alerts you don’t have to manually check the trap, and you also don’t have to worry about a trapped animal being inside for too long. Join us after the break for a demonstration video showing off all the features, and a real world example.